How to Be the Best Treat Giver On Your Block! I remember when I was a kid, all the neighborhood kids and I would get together and map out a game plan on Halloween. We’d make sure we knew all the houses that gave out the very best treats, and get to those early before they ran out. Certain houses earned a reputation when it came to doling out the “good stuff” to trick or treaters! Now as an adult, I find myself thinking about how I can impress my trick or treaters with “the good stuff”. Nothing’s better than seeing the smile on a child’s face when you treat them with something exciting or unexpected. What if, however, in addition to a treat… you could actually help gift a child in need with a whole family?!?!? Well, I’m happy to share that this year I will… and you can too! 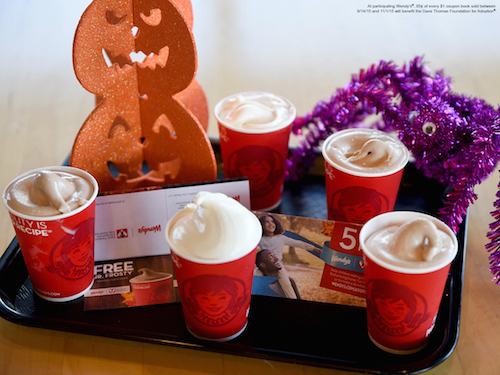 From September 14 through November 1st, Wendy’s is selling Halloween Coupon Books. 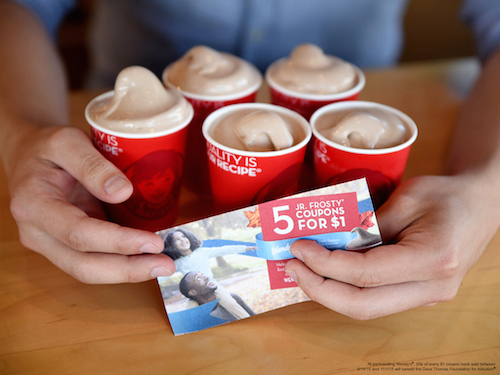 For just $1, you can get five or 10 free Jr. Frosty Coupons*. Give out these to your trick or treaters on Halloween, instead of candy. How does this help kids find a home? What’s the Dave Thomas Foundation for Adoption? This is a foundation that was founded by Dave Thomas, founder of Wendy’s, in 1992. Dave was adopted as a child, and understood the importance of having a family. He believed that children in foster care “aren’t someone else’s responsibility, they are our responsibility”. That’s why the Dave Thomas Foundation for Adoption works to find permanent, loving homes for the more than 130,000 children waiting in North America’s foster care system. Wendy’s has continued to support Dave’s belief through fundraising and collaboration with the Dave Thomas Foundation for Adoption. This year, don’t just be the “best treat giver” on your block. Consider purchasing these Halloween books at Wendy’s so that you can give the best treat both to children in your neighborhood, as well as those waiting for a forever home all over the U.S.! 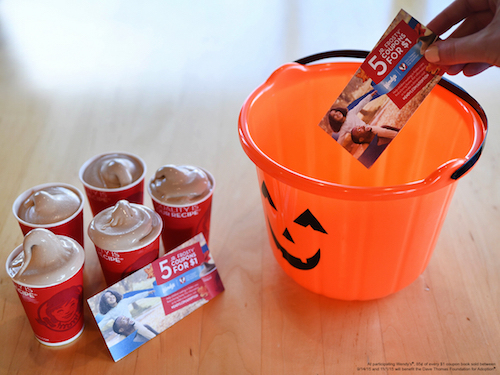 ** $0.85 cents of every dollar from the Halloween Coupon Books will go to support the Dave Thomas Foundation for Adoption. Groovy Joe Children’s Book Prize Pack Giveway!